In a long interview with David Remnick of The New Yorker, President Obama once again commented on the son he never had. This time he refused to allow the hypothetical tyke to play in the NFL. 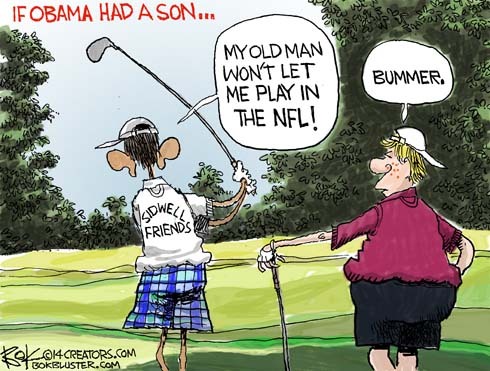 Wonder if he’d let his imaginary son serve in Afghanistan? 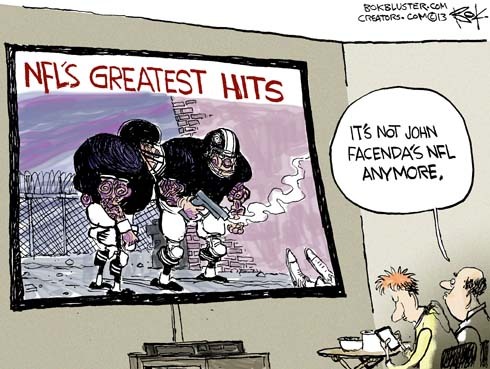 John Facenda was known as The Voice of God. He was famous for his over-the-top NFL Film productions glorifying the manly ideal of the players. Now pro athletes glorify themselves as gangsters and rappers. At least that’s how Jason Whitlock sees it at Fox Sports. He says, “… popular culture has installed Tony Soprano as America’s most celebrated and revered icon above Joe Montana”. The Wall Street Journal says that on a psychological profile Aaron Hernandez scored a perfect 10 on focus and a 1 on social maturity. 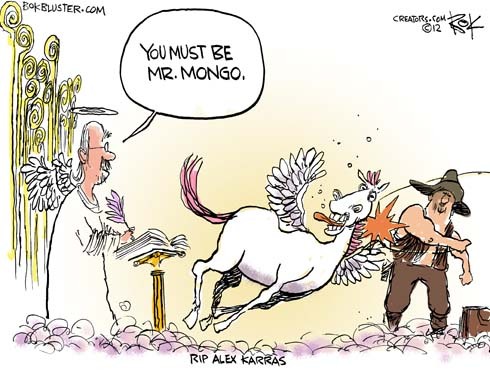 Alex Karras died Wednesday. He played football for the Detroit Lions. He was also a pretty funny guy who appeared on on Johnny Carson and in movies. In one of Karras’ most famous scenes, as Mongo in Mell Brook’s “Blazing Saddles”, he slugged a horse knocking it out cold. Blazing saddles could not be made today. There would be naked starlet PETA protests (this is bad? ), and the horse would be evaluated against his baseline concussion history and required to sit out for at least a week. Blazing Saddles mocked race relations, sexuality, Hollywood, the American Frontier, and Methodists. It fails the Civil Discourse test miserably. It’s hilarious. Pop culture references are tricky. 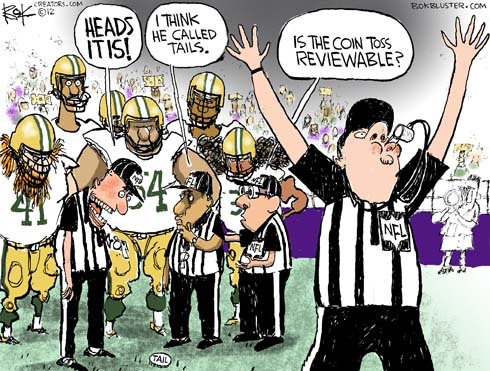 I thought I’d take a break from drawing about lying, incompetent politicians and instead draw about stupid, incompetent NFL replacement refs. Here’s a Bleacher Report that looks into who the replacement refs really are, including one who was kicked out of the Lingerie League! 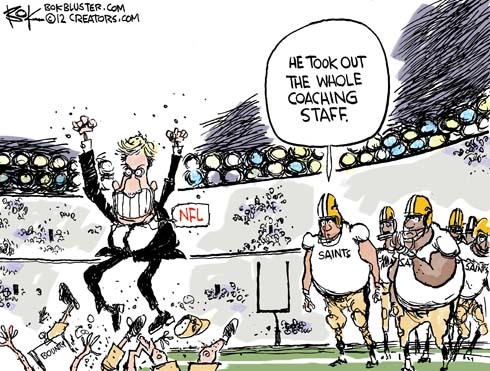 Goodell sacks bounty hunter coach.